With the clock going forward I slept in and was late getting out of bed. When I did venture out of the tent and after taking just a few steps, something moved. It was a half metre lizard just a few metres from the tent. I watched it before it bottled it and headed into the swamp for safety. 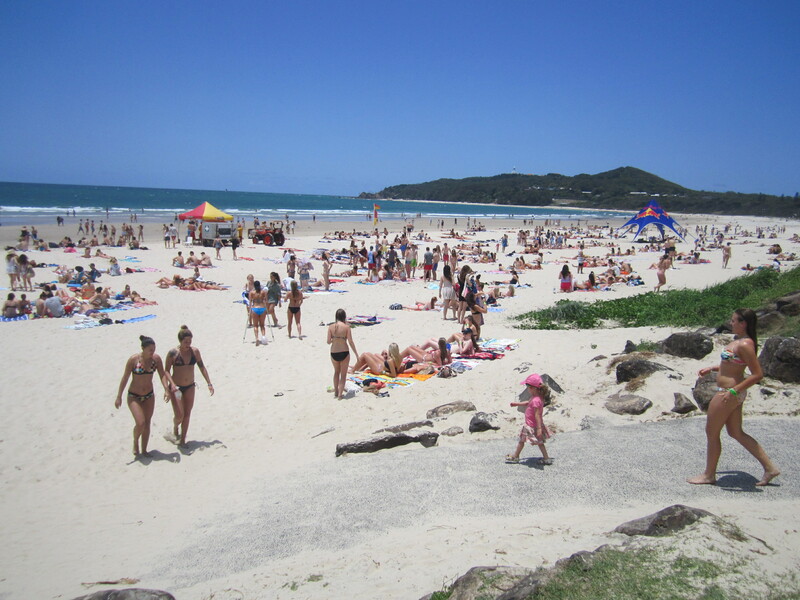 It has been said to me more than once that you come to Byron for two days and end up staying a week. So I was keen to get out and make the most of my day. I left the bike parked up and walked the 3 km back to town. It was surprising how many people were about for a Sunday. I went on to the beach and headed South towards the lighthouse. The beach is very nice and clean. The water was warm as I walked in and out of the water. It is then a steep climb before it flattens out. The path then follows the cliff’s edge. Awesome view – from the cliff you could see some decent-sized turtles and further round you could see loads of dolphins swimming. 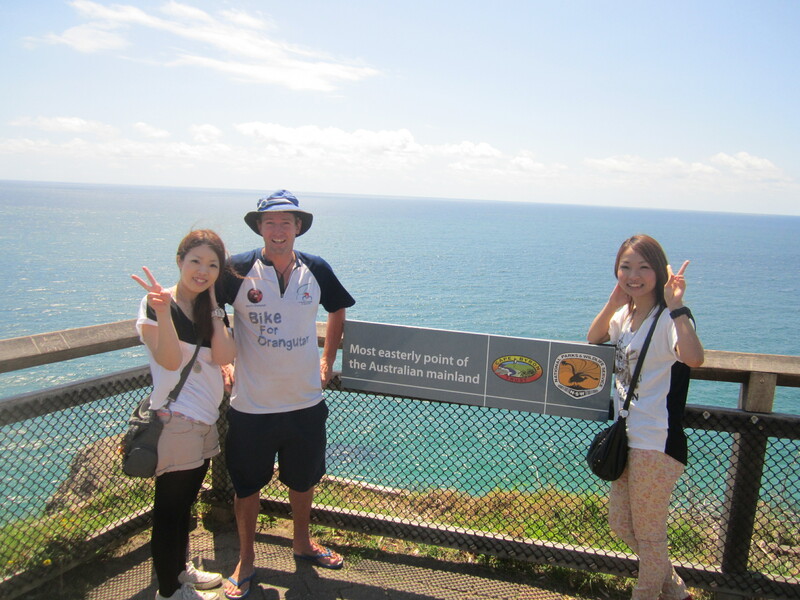 From the top of the cliff I stood next to a sign which marks Australia’s most Eastern part of its mainland. But not the most Eastern part of my journey. Reaching Melboune I will be continuing East to New Zealand. Reaching the lighthouse you got an even better view and I could see even better beaches in the distance. Returning along the track I spotted a rock wallaby and its little joey popped its head out.. Lots of sun and walking has tired me out. I spent the rest of the afternoon relaxing in a cafe. I am leaving the coast today heading inland to avoid the busy coastal highway for a while. 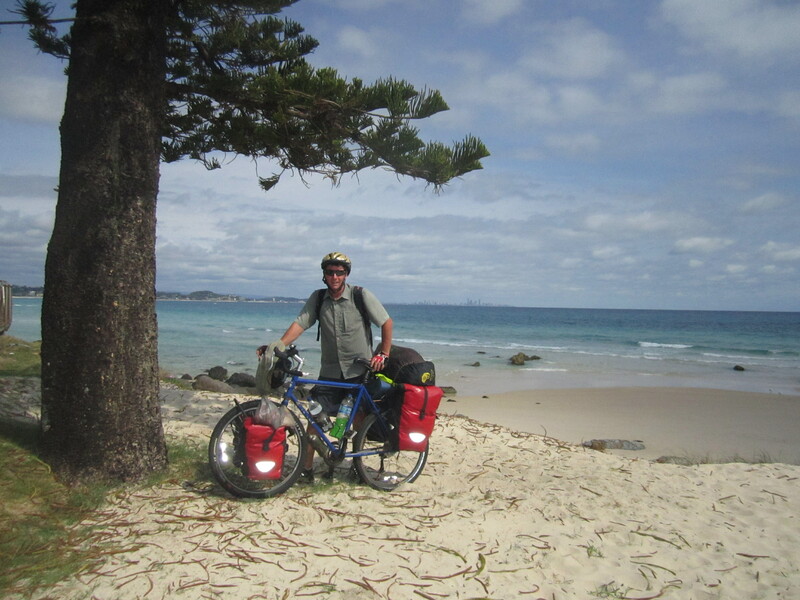 I am heading to Lismore and will call in on Scott, a friend I met 11 years ago on a Middle East overland tour. It didn’t take long for the road to rise sharply from the coast and I got a good workout. From the top I had a great view with the ocean still in sight. Following the ridge line the road was very rolling and I was now in a very green New South Wales which is a country full of lush grazing pastures and macadamia nuts.Within 30 km I had already passed through 3 towns with a real country feel. Full of character with their heritage buildings. I got to Lismore around midday. It was pretty hot now for cycling with the temperature in the mid 30’s. To get to Scott’s place I had to cycle 7 km up another big hill. Halfway up, I was starving and feeling pretty exhausted and over heating. I had to stop and make a few peanut butter sandwiches to get me up the rest of the hill. It was only a 60 km day. But it was enough – I was done. After a much needed rest, Scott took me for a tour through town. Lismore is on a big river and in the past it serviced many steamships working the river. For $2 the Heritage Museum was good value full of lots of interesting things from the past. Just as I started to cycled out of town, I had to cross a long old wooden bridge. The planks were running long ways. The bitiumen that once covered them was now gone. I had to carefully dodge the gaps that had opened up between the planks. I cycled one hour before I reached the little town of Tabuilum. I needed to find some water. Couldn’t find a tap and none of the shops were open so I pushed on. I knew the next town Drake was only 22 km away. I got to Drake at 10 a.m. after I had to climb some quite steep hills. Found a small park where I was able to fill all my water bottles. I had a 2-hour morning tea break and a bit of a lie down. I wanted to have a bit of a rest after hearing for weeks that the climb up to Tenterfield was really steep and I would probably have to get off my bike and push. News also that it was a 50 km climb had me worried. I was thinking of calling it a day and starting fresh in the morning. But in the end I thought I’d go for it. Some parts were very steep but I just toiled away in a low gear. It was a very nice climb through the forest. Apart from timber there used to be a few old gold mines about. I made good steady progress. I was offered a ride halfway up, but declined. After 30 km I stopped for a rest………..was only short as I had to hurry on when I heard a severe weather warning had been issued for the Northern rivers. This caught my attention. But what caused my panic was when hailstones as big as golf balls could be expected for Grafton and Tenterfield………..I was still 20 km away. I upped the tempo when it started to spit with rain. I was still climbing………then to make things worse I got puncture number 47. So I quickly changed it in the light rain. Shortly after I crossed the great dividing range at a height of 888 metres, it was then a nice run downhill into Tenterfield and bright sunshine came out for my arrival. Tenterfield looks like a thriving town with lots of small businesses. Lots of nice old buildings with character as well. I called into the supermarket to see what I could get for an easy dinner. Some apricot chicken curry caught my eye but at $6………I asked the deli assistant if it would be getting reduced later. She replied yes. I replied how about reducing it now. She obliged and I got my apricot chicken curry for a bargain at $2.50. I sat in the park and had my dinner before cycling to the edge of town and setting up camp in a roadside rest area. I tried to get my tent under cover. Yesterday afternoon I left the Bruxner Highway when I reached Tenterfield and this morning I started heading South on the New England High. But not before I packed up my very wet tent from last night’s storm. I cycled 16 km before reaching Sandy Flat. Not a lot here now………The information board gave a nice insight into its past. I thought I was now on the Tablelands. Quickly discoverd I wasn’t as I started to climb a very steep 1028 metre Bungulias hill. A hard climb is always rewarded with a down run which came out on to a bit of a plateau……..all the hills have suddenly disappeared. At 50 km I reached Deep Water. The pub had burnt down and was now a shed with limited hours. For days I have been going parallel with the old railway line. The tracks are still down. But sadly they had their last trains in 1988. I cycled up to have a look at the old Railway station. Looking grand with its recent paint job and I met a group of painters that use the station once a week. They invited me in for a cup of tea. I used the time to get my wet tent out and hang it over the the platform edge to dry. After an hour and a half and a cup of tea I was on my way. It was very hot and sunny. In the distance I could see some dark cloud. I cycled straight into it. Wasn’t long before I was drenched. Cycled in the rain for 10 km before the sun returned and at least over the next 20 km I dried out somewhat. Getting to Glen Innes I dived into McDonalds to use the internet. That was a waste of time because it didn’t work. Just as I was heading out of town the skies opened up again. So to save the hassle I cycled into the caravan park. Had to wait in reception for 1 hour before I could put up my tent. This morning I opened my tent to find a wet and misty morning making me think I was going to be in for a wet day. But within 30 minutes the sun had burnt this off. There is a lot of farming around this area – cherries, strawberries, grapes, sheep and cattle. The extra kilos I put on during my break in Brisbane are soon disappearing. I thought I was in for a flat ride………but for the third day in a row I found myself climbing over some mountains called the Ben Lomond range. Just before lunch I got to Guyra. Spent the afternoon here before heading off again in the direction of Armidale. It was a very hot afternoon. This region is currently experiencing a heat wave. Just short of Armidale I saw a rural fire service shed on the side of the road. Looking for somewhere to camp I have put my tent on some grass behind the shed. It was only 12 km before I reached Armidale, quite a sizeable country town. Lots of nice old buildings again. I stocked up at the supermarket and then went to the libary to use the internet. One good thing about the libraries in NSW is that they have free internet and free WIFI. The library was closed. Luckily I was still able to use their WIFI. I went to the bike shop before I left town. Just as well I bought a new inner tube because this afternoon, I ripped the valve off the tube. Two in two days is a bit of a worry. I am wondering if it is because I might be under inflating my tyres which is because I am worried about overinflating them in the heat because I am afraid they might burst. Cycling towards my lunch stop Uralla I was overtaken by about 100 hot rod cars in a 20 km stretch. I found them all parked up in Uralla when I arrived. By this time it was starting to get very hot. I grabbed a sausag roll from the bakery……….I live out of bakeries now. Then called in to the Tourist office for a chat. Found a nice place 50 km away to camp. Had some more hills to cycle up. I was mistaken if I thought I was on the tablelands because the sign entering Uralla stated high country and the caravan park claimed to be Australia’s highest caravan park at 1320 metres. I was pretty hot when I got to Bendemeer. The rest spot was down by the river. I saw people swimming and I was soon in as well cooling off and having an overdue wash as well. The no camping signs put a damper on things. Some locals told me to just go a bit further up the river and to camp behind the Rodeo ground and it wouldn’t be a problem. There was another really nice old single lane bridge that used to be part of the main highway up until 1985. Its for a pedestrians only and I crossed it hoping I would get a glimpse of a Platapus or a turtle which I had been told you often see. It wasn’t long this morning before I could really feel the heat. It is going to be over 40 degrees today. Early mornings I frequently see kangaroos and rabbits which disperse as I approach. Just before descending the very steep Moobi hill I took a 1 km detour up to the lookout. Nice view and would have also been a good place to camp. I got into Australia’s home of country music around 10 a.m. went to the tourist office and hung out in their A/C while I recharged everything. Not looking forward to getting back out in that extreme heat this afternoon. I did get back out into it after a few hours in the town. I slowly climbed my way out of Tamworth. The sign read 47 km to Wallabadan and that is where I am trying to head. After 30 km I had to stop for a break and then getting back on the bike my legs were dead. I was struggling to cycle every km. It was so hot the tar had melted and the bike was sticking to the road. I had to keep stopping for a break. When I got to 47 km there was no sign of the town. I kept pushing on. It was starting to get late in the day and I thought I might have to find a place to camp beside the road. I then got a puncture. 3rd in 3 days – puncture 49 now. I fixed it and then pushed on. Found a sign for 6 km. Now 12 km further than I had planned. With hope of a town close by I pushed on. I got a bit of a break because it turned out to be a descent into Wallabadah. I was very relieved when I cycled into the free rest area next to the river. There were a few people camping. I changed straight away and jumped into the creek to cool off. We got a good storm last night. It passed pretty close and the thunder was pretty loud. Luckily it was a dry storm with only a little bit of rain. I was quite well-sheltered because I put the tent up behind the eletric BBQ which was under cover. Before I left I visited the 2nd fleet memorial gardens. which was dedicated to all the sailing ships that came out to Australia with convicts and early settlers. It was very well put together. Then when I was about to leave I could see thunder and lightning approaching. Just as well I waited because there was a huge downpour. I had to wait 2 hours for the storm to pass. Rather that than getting wet. It’s nice now that the distance between towns is not so great. After 20 km I had my first stop in Willowtree. Then another 20 odd km I stopped for lunch in Murrurundi. The towns are a lot richer now. The road is lined with many horse studs and breeders. I have now entered the upper Hunter valley. The road is still up and down……..but more pleasing…….with more downs. For $1 I visited the local museum which explained a bit of history about the old railway and some of the tragic accidents that had occurred as well as a bit about the old shale mines in the area. I then did the 1 hour walk to see the mountain on fire. It has been burning for thousands of years after a coal seam caught fire. It burns underground and as it does the land above collapses. At the top you can see the smoke coming out of the ground as well as feel the heat.The area of current activity is completely barren with no vegetation able to grow. In the night there were was some strange grunting noises close to the tent. I am pretty sure they were made by a Koala looking for a mate. I haven’t seen a Koala yet and I should have got up for a look. Again, I only had to cycle 23 km and I was in Scone. Another money town…….lots more stud farms on the way into town. Traffic on the highway has increased with lots of coal mines about. At one point I had to get to the side of the road when part of a huge dump truck for a mine came past. Around 2 p.m. I passed through Muswellbrook. On the way in I saw a Vietnam war memorial for all the Australians and New Zealanders that were killed. Muswellbrook was a fairly big country town. 12 km down the road was the turn-off for Lake Liddell. It was then 4 km up to the campsite. For only $5 a night I have camped right on the lake’s edge. Its very nice with the reeds growing and lots of birds about. On the other side of the lake is a large power station. It was quite pretty lit up at night. Over the road from the camp ite is a main railway line. I say main because every 10 mins there is a train carrying 80-90 coal wagons heading out to the Newcastle coal export terminal or the empty ones going back to the mine. It was a pretty easy day with just over a couple of hours cycling. and only a few hills. There were a lot of trucks on the highway. I passed about 4 or 5 coal mines along the way. Quite a scar on the landscape. Arriving in Singleton you can see it is a real mining town with all the mining trucks about and all the people are in High Vis. In Singleton I am staying with Imogen who is a friend of Heather who I stayed with in Brisbane and who is kindly letting me stay for a few days. In the afternoon I went for a walk through the town. They claim to have the world’s largest sundial. Singleton has some lovely large churches. One of them has a nice monastery. This morning at 7 a.m. Imogen went to work and I went to McDonalds to use the free WIFI. I was quite surprised at what I observed. There were a lot of overweight people coming in for breakfest. What also stood out was the number of parents bringing their kids in for breakfast before school.With my free time I had a day of planning out my route for the next few weeks. Have found some nice National parks to visit along the way. You can’t beat local knowledge. Last night Imogen helped plan out a route that would keep me off the busy highway. I had an awesome morning cycling on the much quieter backroads. Very windy. A little hilly. But very pretty, mostly open farmland. I stopped to have a look at Oakhampton cemetery which dated back to 1849. Nicely placed machinery on the river bank. Buried here is one of the founders of Arnotts biscuits. While I was in the cemetery I got stung on the head by a bee or a wasp. It blooody hurt. But luckily I didn’t have too much of an allergic reaction. Just up the road was the old waterworks. The grounds consisted of a 3 km dam which I cycled around. Some very nice decorative brick buildings with large chimney stacks. A lot of old machinery and 4 filtration ponds. The area is now a reserve with birds, picnic tables and BBQs. I had a bit of a snooze on one of the picnic tables under the shade. A guy came round who was working in the grounds. I chatted to him for a while and discovered he was doing community service. Mid-afternoon I cycled into Maitland. Lovely old town with many old buildings restored and full of character. I bought some pies from the bakery and they gave me an extra one to take with me. Was told to have a look at East Maitland before I left because it was all so nice. On the way I met a cyclist on the way home. We chatted and he then offered to let me camp in his backyard. I accepted and Maris quickly rang his wife Gerry to warn her. Maris is a secondary school teacher and they also have a catering business. I got a beer and a very nice home-cooked meal. Yesterday I lost my phone. So first thing this morning I had to head to the mall to replace it. It took about an hour. Lost all my numbers..but at least I got to keep my number. I don’t have far to go today. I started with a little detour up to Morpeth. Another lovely old town on the Hunter river. All the old buildings……….banks, post offices. All looking very grand. The old bakehouse once owned by the Arnott brothers is here. Some more beautiful backroads in the afternoon. Got another puncture (52) I had one yesterday as well….which meant a short delay. In the afternoon I had to cross over the Hunter river a few times. Stopped late afternoon in Ramond Terrace. I then headed out past Grahamstown dam towards the coast and Nelson Bay. After the dam I was flanked by national forest on both sides of a rather thin road. Nowhere to camp. Got to Salt Ash and thought about camping in the public rest area. But only 200 metres from the service station and bottle store. I thought that might be a problem later so I cycled on a short way and found a nice grass area just off the road next to the entrance to a farmer’s field to camp for the night. It was an easy 25 km Sunday morning cycle into Nelson Bays. I turned up at my friend’s Lisa, who I worked with in Amsterdam back in 2000, door at 9 a.m. Thought it may have been a bit early, but with two kids she was up. Nelson Bays is a real holiday town. In the afternoon Lisa took me for a little drive around. She also took me to the doctors……………I have had a infection on my leg for weeks and weeks. I thought it had been healing up nicely. The other day I replaced the dressing with a sticking plaster and overnight I had a red line along the length of the plaster that gave me a bit of a fright. I had visions of ending up in hospital. My mind was soon put at rest after seeing the doctor. The overnight infection was caused by an allergic reaction to the plaster and the doctor said the other infection was healing fine and not to bother covering it any more. He had a bit of a chuckle when I told him I had been treating myself with antibotics…………and recommended that I probably shouldn’t do it again. Back into Nelson Bay and down the coast the other way to the golden sandy beach of Fingal Bay. There were a number of sea eagles hovering in the wind as well. I spent the afternoon planning my route into Sydney. We had a bit of a rain delay to the start of the cycling day.It was raining quite hard and I wasn’t keen to venture out into it. It was looking like I was going to have to call it a day. Then suddenly around 10 a.m. it cleared and I made a run for it. When I got to Stockton on the outskirts of Newcastle I just followed the road that took me over a bigger than normal bridge which was crossing the Hunter river. There was no cycle lane and as I cycled closer to the top, it was frightening as I had to fight the very strong sidewind. I thought I was going to get blown off my bike. I was so relieved when I reached the other side. I passed through Newcastle,s huge coal terminal. Mountains of coal on one side and boats being loaded on the other. I skated around Newcastle itself and found some more hills to climb. I joined the Pacific Highway with Lake Maquire on one side and the coast on the other. I left the highway and cycled 8 km up a small peninsular. I had planned to camp on the top in a national park. This idea was scuttled when I got to the gate and found the park was now a restricted area. The sign that read « Trespassers will be prosecuted » and on the spot fines deterred me from going any further. I cycled back to the village and asked at the garage « Where could I camp ? ». They directed me to a dirt track that took me down to a grass spot next to the lake. There were already a few people camping here. I got the impression they were permanently camped here after falling on hard times……….. it was a lovely spot to relax next to the lake. Pelicans were swimming out in front of me. I am having a terrible run with punctures. I had another two today: one in the front tyre and one in the back tyre. I have now put two brand new tyres on the bike which will hopefully put an end to punctures for a while. Australia is starting to turn into the wettest country I have been to so far………we had a bit of rain during the night. But really rain hasn’t been that bad over the whole trip. Very quickly this morning I left the Highway and took some queiter coastal roads following the contours of the sand dunes. I found a wooded broad walk that took me down to the beach. Nice to see a beach with no urban development. What I could see was a line of ships waiting their turn for a berth at the coal terminal. I passed through Gosford early afternoon. I called into the first bike shop I saw to get another inner tube………..yesterday when I repaired my punctures I was just going to throw my spare inner tube on the front tyre. I got a surprise when I found the valve was too big and my spare tube would have been absolutely useless if I had needed it so I dived into the first bike shop I saw. For a split second I did think about cycling past it……..but thought of Murphy’s law and the hassle it would be if I lost a tube. Gosford is inland and surrounded by lots of nice water with luxury boats. Leaving Gosford I had to cycle up the steep range. It was nicely shaded by forest on both sides of the road. The cool air was appreciated. I stopped at the Kuriang look out at the top. 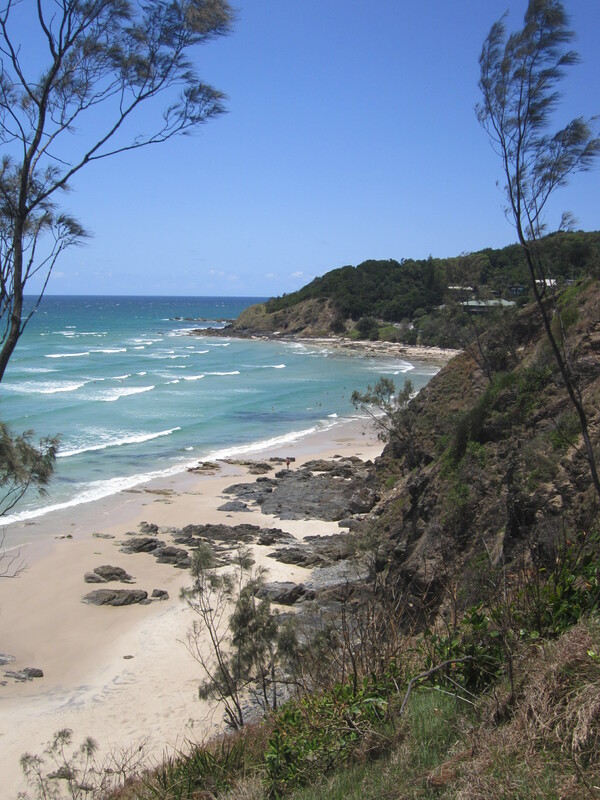 Here I left the Coastal highway and went on to the old Pacific highway, once the main road out of Sydney……..but now virtually dead. Not far down the road, Girrakool reserve caught my eye. I cycled into the reserve where there was a notice on the gate « Gates closed 5 p.m. till 9 a.m. »………but there was a small gap next to the gate if I needed to get out. I found a nice flat area in the reserve and a picnic table. It was already 5 p.m. I didn’t get too comfy. Wasn’t sure if someone was going to come round and move me on. But around 8 p.m. and just before it was going to get dark, I popped the tent up and things were as good as gold. 5:30 a.m. I was up and deleting any trace that I had camped the night. I wanted to get moving before I was found. It was a real treat cycling along the old Pacific Highway this morning. Its a real scenic trail. Very up and down and constantly twisting through the forest. Lots of glistening lakes in the valleys. Early morning, I was cycling through in and out of a thick mist. At one point, the road came down to cross the Hawksby river which we crossed using the lovely old metal bridge. Today, I am heading to Galston to stay with some friends I met in Turkey. They have a property which is very convenient because it is on the outskirts of Sydney and has spared me for now the stress of cycling into the centre of Sydney. At Barerra I left the Old Pacific Highway and took a very skinny winding road down to Berowa waters. Here I got a 2-minute ferry across the river and all that was left was a very steep 4 km climb and a 6 km cycle to Galston where Terry and Susan have a lovely property which is an ideal place to relax………and I am now just doing that on the back deck looking out over a few fields followed by some bush. Birds everywhere and a swimming pool just a few steps away. There are a few horses here and we may go riding tomorrow. This evening we had a good old BBQ and sat out on the deck enjoying the country life…………. I had three more nice days in the country. Got into a routine of going with Terry and Susan every morning to Fagon Park to walk the dogs. Fagon Park used to be a farm that was bequested to the community. It now has a mixture of native bush, herb garden, world gardens from England, Holland, North America, South America and Africa with plants from those regions. There are a few lakes with plenty of birds. The farmhouse has been kept along with some other old buildings and all the old farm machinery. It was big enough that every day we could take a different route. We always saw some monitor lizards sunbathing next to one pond full of water lilies. On Saturday I took the bus a little closer to Sydney and it was good to catch up again with El and Otto who I last caught up with in Indonesia. They are here for a day before flying to New Zealand. After picking me up from the train station we got fish and chips and went round and ate it at El’s mum’s. She has a deck at the back of the house and on it were some feeding trays that worked well because we soon had 8 rainbow lorikeets, a couple of young kingfishers and a couple of kookaburras on the deck. This morning I ventured a little further into Sydney. Terry helped plan a route that would keep me off the busy roads as much as possible and this worked well. To cross one major road I had to put my bike in a lift to get across an overpass. Had to take one of the front panniers to make it fit in the lift. I am staying with Matt and Violet. 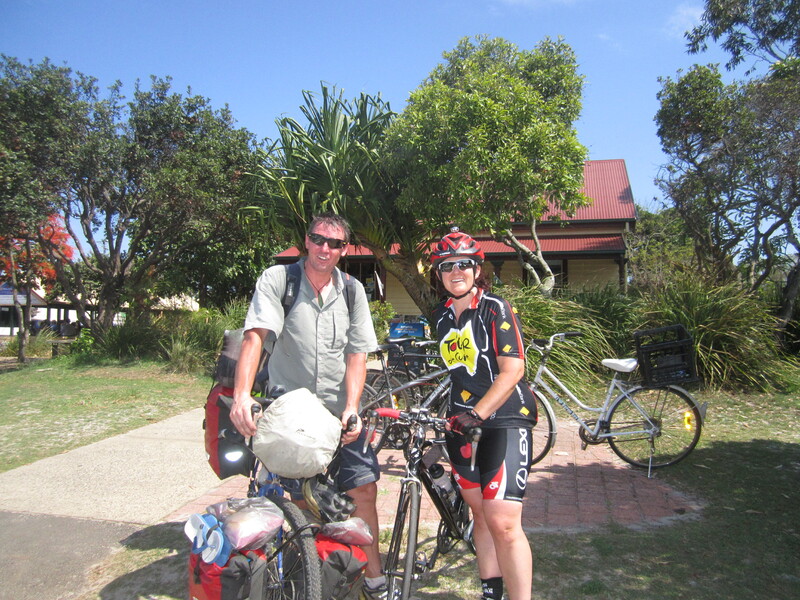 They have just moved over from New Zealand with their two kids, Reuben and Hannah. I met Matt and Violet back in 2004 while we were all travelling through South America. Day 627: Tuesday………I have never really been to Sydney before……..so it was quite exciting catching the super cat ferry from Rydeameal all the way into the city. We passed the Olympic park site…….eventually passing under the Sydney harbour bridge before we berthed at Central Quay. It was a lovely sunny day on Sydney harbour. I walked around and had a closer look at the opera house. One of the two must-things to see in Sydney. I then walked through the botanical gardens and a little further to the next bay where the Navel dockyards were. I explored around the old area called the Rocks and visited the Discovery Museum which had a few archeological items from the area. A huge cruise ship was in town and there was a hype of activity on the waterfront. One last thing before I got the ferry back was a quick look through the interesting Contempory Art Museum. Catching the ferry home was a nice way to finish a busy day in Sydney. Day 628: Wednesday – Stayed a bit closer to home today. I walked the 6 km along the bicycle trail up to Paramatta. Checked out the historical buildings of interest had a short walk along the river and caught up Glen for a beer who I met in Thailand on the way through. Day 629: Thursday – This morning Matt gave me a ride into the city on his way to work. I then walked down George Street to Circular Quay. It was a way of checking out a bit more of the city. At 7 a.m. it wasn’t too busy. I liked the way there were many old historical buildings hidden between the glass high rises, some with stunning clock towers. When I got down to the quay I jumped on the famous Manly Ferry. It was a lovely morning for it on Sydney harbour. I went over to meet another friend Heidi who I worked with in Amsterdam back in 2000. She was just as bubbly and full of life as the last time I saw her. Heidi took me for a drive up the coast to Avalon and Palm Beach. 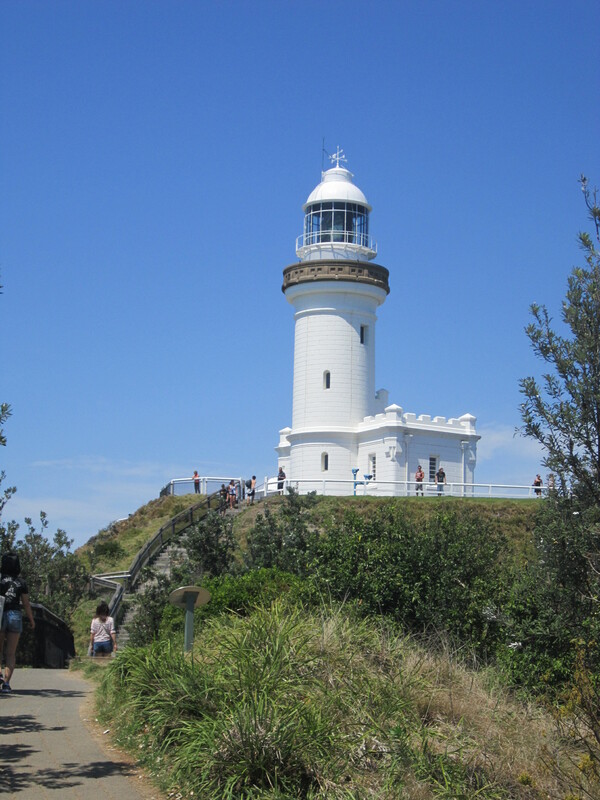 Palm beach is where they film Home and Away……..we saw the film crews filming a small scene. Heidi and I walked up to the lighthouse for a special view of the golden sandy beach below and the rugged north coast. Heidi works for a clothing shop and she very kindly gave me some new shorts and a singlet top which I am already wearing. I got the bus back into the city and then caught the ferry to Cookato island. The island started off as a convict prison, later a navel base and ship building yard. The Island still has some of the convict cells and guard’s huts dating back 175 years. From its ship building days the slipways and dry docks still remain so do the old cranes and the massive work shops which are full of giant lathes and other large machines. It really was a very interesting island. There were a number of tunnels that crossed the island from East to West. The island even had its own power station with a towering brick chimney. Day 630: Friday afternoon I caught up with Glen and Vanessa, Who I met in Iran. They are riding the world on a motorbike and have just come home for a few weeks to see the family. They are off to Africa next. It was a good couple of hours reminiscing about Central Asia. For the first time in a long time I got to see some live sport. Matt has some season tickets for the A league football. We went and watched the West Sydney Wanderers beat the Adeliade United 6-1. Day 631: Saturday – Thanks to Violet we had pancakes for breakfast then Matt, Reuben and I went over to Bondi beach for a swim and coffee afterwards. This afternoon Matt and Violet took me into the Darling harbour waterfront for a nice dinner on the water and a bit of a wander around. Back on the road tomorrow…………. I picked Sunday morning to hopefully give me the best chance of a smooth ride out of Sydney. The first two hours I followed the cycle path. But along the footpaths it was a bit slow with only 16 km. So even with no hard shoulder I jumped on the road to speed things up. But it wasn’t long before I was on the Hume Highway heading for Canberra. 55 km down the road I stopped at the roadside rest area. It was really starting to heat up now. I had to have a 1h4 0 lunch break. Part of that I needed to close my eyes. There was a little bit of drama in the rest area when police stopped a woman on suspicion of driving under the influence. It was just a police stop. The woman was a little distressed due to the situation she was in. It was adulating country. So I had to work hard climbing a few hills. Passed through a bit of state forest which was nice and over some very high bridges crossing the valleys. Late afternoon I left the Hume Highway for the quieter Old Hume Highway. Not long after the hot sticky weather turned into a light rain slowly getting harder. Luck had it that straight away I saw a sign for fire station. That was enough for me. I swung left and a couple of hundred metres up the road was a fire station. I swung round the back, quickly set my tent up in the rain and got in and that was where I stayed because not soon after very heavy rain, thunder and wind arrived. 1 a.m., I was woken when the fire engine left the station……….it returned at 2:30 a.m. No-one knew I was there. In the morning there was a fire-hose laid out beside the fire station. It’s Christmas eve…….I cycled a few km into Mittagong. Pies for breakfast. Next town was Burral. Home of Don Bradmen and the Bradmen museum. It’s all old towns along the old highway. Stopped for lunch at Marrian……..another old town full of character. Struggled again with the heat. Still very up and down………the old legs are tiring. When I got to Goulburn I stocked up on food before cycling just a few kms out of town to a public rest area and I set up the tent. A bit disconcerting was the sign beware of snakes. Soon after I had the tent up, I had a lady come over and see me. She said when she saw I was going to be spending Christmas Eve alone she felt for me and I was very moved when she gave me a hug and a small present. With these hot sticky days there is now a regular afternoon storm. The weather changed very quickly and a severe storm came through. I found myself in my tent with heavy rain and strong wind. The size of my little tent was half with the wind blowing in one side. Soon after a guy came over and asked if I would like to came in his garage, just 2.5 km up the road. I agreed with his suggestion straightaway. By the time I cycled up to his house I was soaking wet and freezing cold. The hot shower worked wonders. In the end I hung up all my tent in the shed to dry and I just slept on a mattress. Mick had a full house with about 20 people – brothers, sisters and all their families. A BBQ was on offer………..but unfortunately I couldn’t touch it because I had lost my appetite after getting too much sun today. It was very nice of Mick to invite me in and I was very thankful. I had a nice evening………..and the two beers finished me off. One of Mick’s brothers has a contact in shipping and has promised to look into a boat to New Zealand for me. Merry Christmas…………If I can get to Canberra today…..I have the prospect of a nice meal, some good company and a place to stay……….thanks to my friend El………who has some family there and has aranged for me to call in on them. Heading back to the main road at 7 a.m. I came across a train spotter with video camerra set up on top of a bridge. When I first saw him I thought this is odd 7 a.m. on Christmas Day. I actually first thought there was another reason he was waiting for a train. Cycling on Christmas morning the road was nice and quiet. For a change the hot sunny day had gone and it turned out to be freezing cold all day. Normally after half an hour I would have worked up a sweat and would remove my cycling jacket, but not today. I stopped off at lots of rest areas along the way. Each rest area is dedicated to a VC recipient and an information board tells the story of why they were awarded it. At one rest stop I met a couple who were quite interested in my trip. They asked if I had somewhere to go when I got to Canberra. I got the impression that if I had said no I would then have had a place to go. I cycled in to Canberra around 2 p.m. It was like a real ghost town. The streets were deserted. I cycled out along the lake towards Kumbah to get out to El’s Aunty and Uncle’s house and El’s mum was there too. Kumbah turned out to be in the hilly part of Canberra and I had to climb some big hills to get there. It was really nice to have somewhere to go on Christmas Day. Soon after I arrived I was kindly given a nice Christmas dinner. It was interesting talking to El’s Uncle Richard who now retired had served as a pilot in the Royal Australian Air Force. After a nice breakfast I said goodbye to my hosts and cycled back into Canberra. I first stopped off and visited the new Australian Parliament. Then it was down to the lake for a little cycle before I went up to the Australian war memorial. ANZAC avenue started with a New Zealand monument. The monument was huge and not what I expected because it was similar to the Imperial War Museum in London. It took me over two hours to walk through the galleries full of planes, cannons, jeeps, helicopters, Diareamers of the battle field, Gallipoli display, First World War, Second World War, Vietnam, Korea, Boer Wr, Iraq and Afghanistan. At 4 p.m. I finally started to head out of Canberra on the Barton Highway. It was a lovely afternoon. The sun was out, no wind and it was very nice to cycle. It was about 12 km before I crossed the ACT border back into NSW. I then pulled over at the first Rest Area and set up for the night. As soon as the sun started to go down it got very cold. I had to put on all my thermals before I went to bed. In the night I think I had what was a wombat or wombats near the tent. They were making some horrible frightening noises……..which were probably just mating calls. This morning I continued up the Yass Valleys Barton Highway. The region is full of wineries and horse studs. The horse studs perimeter is immaculate with white fences lined with evenly spaced rose bushes and small shrubs. I am in a lazy mode, so when I got to Murrumbateman I had a 2-hour morning tea in a lovely shaded park next to a duck pond. When I did get back on the road the traffic was heavy. I stopped at Yass and spent the afternoon resting in the park………I have a little flu after being caught out in the rain the other night. I used the electric BBQ to cook up some mince rissoles. The local infomation centre kindly made me a coffee. I was going to cycle out of town to camp. In the end I decided just to wait for the sun to go down and I put my tent up in the far corner of the park behind some trees. It was only in the morning on the way out that I saw the sign for no camping. While I was waiting for the sun to go down, I had a lady bring me over a plate of Christmas desserts. I then joined them for a drink. They invited me to go and stay at their place. Unfortunately it was a bit late and I wouldn’t have enough time to cycle the 15 km before it got dark so I declined. They even offered to go home and get their bicycle bumper rack so they could give me a lift…….They have invited me to call in for breakfast tomorrow which I will do. Sleeping in the park in the middle of town, I thought I’d better move on pretty quickly so as soon as it started to get light around at 5:30 a.m. I was up and gone. I cycled back out to the highway and the highway services. Called in to McDonalds to use their WiFi. It was rubbish……….I had better luck with KFC even though I was still sitting in McDonalds. The couple I met yesterday told me to call round for breakfast on my way out of town. So I did……..though I had already had the leftovers of last nightis dinner so I settled for two cups of tea and some fresh water for my bottles. I learnt yesterday that the Yass water wasn’t very good. It is recycled waste water. I was drinking it anyway. The highway was again heavy with traffic and road kill. I saw a large dead snake and I cycled past a live small snake in the gutter. I am always looking out for snakes. But by the time you see them…….you are really past them. The Christmas spirit is still alive. I stopped for lunch at the rest area at Bookham. All the picnic tables were full. I asked to join a family of 3. They turned out to be from East Timor. I mentioned that along the way I had been through Timor. They were very interested in my travels. They offered me some lunch and just before leaving gave me $10 saying it was to help me get on. No sooner had they left I had a group of Ethiopians ask if they could join me. They were part of a church group. They were very friendly and offered me some very nice traditional Ethiopian food. It was pretty hot again when I left. Had some nice big hills for the afternoon. But I didn’t go too far before pulling off the highway at Jugiong to camp next to the public swimming pool. Knocking off at 4 p.m. has given me some time to write my blog and cook some dinner again on the electric BBQ. I stopped off to see the famous dog and the tucker box just before Gundagai. It is a statue of a dog sitting on a tucker box while it waited for its master to come back. In Gundagai I cycled down to the the old railway yards for a look and then onto the two historic wooden bridges which are nearly 1 km long. One was the old highway bridge and the other was the railway. Now in ruins they still looked impressive. For lunch a trip to Woollies and then I went and had a BBQ in the local park. During lunch I got a call from Andy a Swiss guy I met way back in the Northern Territory. We thought there might have been a good chance that our paths crossed again. Five minutes later, he and his girlfriend Teresa turned up with their camper van. Great to see him again. Last time he was working. This time he is taking Teresa on a quick tour of Australia. I was going to cycle on. But Andy very easily persuaded me to join them in the caravan park and to share their site. It was a good plan. Afterwards we went for a walk through the town. Bit of a ghost town after 12 p.m. on a Saturday. Up on the hill was the old prison dating back to the 1850s. We went back to the campsite for a BBQ. Andy and Teresa had gone out of their way to get some steak. It was a very nice treat. Afterwards we watched some live skiiing from Europe on the laptop. Andy and Teresa continued to spoil me with some bacon and eggs for breakfast. It really was nice catching up with them. I didn’t really feel like cycling today. I got about 50 km and stopped in Tarcuita for some lunch…..leftover sausages from yesterday. I was feeling pretty tired. I had a lie down……..I was still lying down at 4 p.m. I made myself move……..but not far only another 13 km up the Hume to the next rest area and this is where I pulled over to stay the night. I had to cycle 57 km before I got to Hulbrook just before 10 a.m. In the main street is a full size submarine which is a bit of a tourist attraction. I bought some steak and sausages and had another BBQ in the park. I had myself another afternoon nap before heading out into the strong energy-sapping afternoon sun. The highway by-passes most towns. I pulled off the highway to have a break from the traffic for 6 – 10 km while I cycled through quieter spots. It was good catching up with you. You are doing what most of us have only dreamed of. All the best for your next leg to Melbourne.